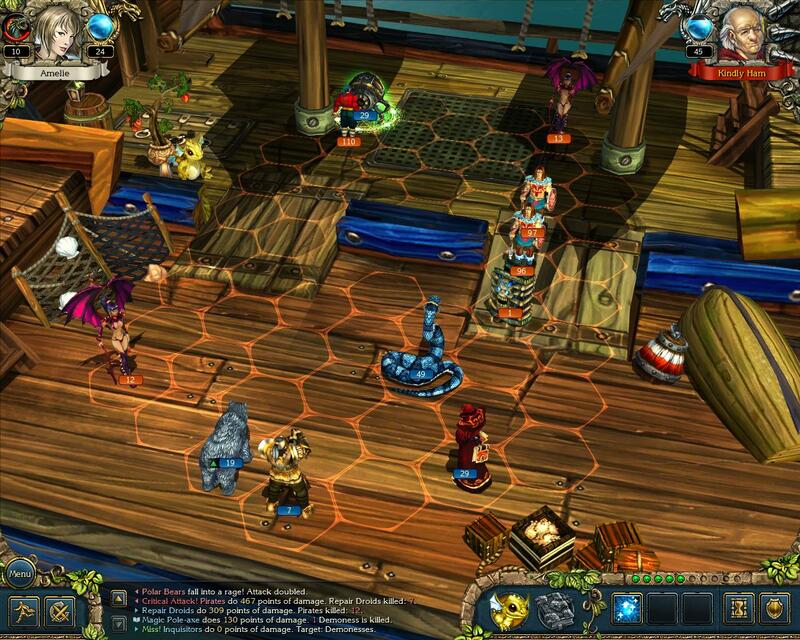 I picked up King’s Bounty: Armored Princess at the Steam holiday sale. It’s rather charming. You play a princess named Amelie who is sent on a voyage to find a knight to save her kingdom. As you can see, the graphics are cute rather than cutting-edge. Amelie hanging out. Thighs don't need to be armored. It’s a turn-based combat game, and Amelie doesn’t fight– she leads! When you’re going around the world you just see Amelie on her horse (or in dungeons, on foot), but she has an army, and it’s her army that fights. You can have up to five types of creatures, the number in each stack being dependent on your Leadership, which rises as you rise in level and find special banners. In a sense the combat is just the sort that I didn’t like in Dragon Age Origins… but that was because I expected that to be more of a real-time fighter. Armored Princess is an honest move-by-move combat game. My favorite creature types so far are royal snakes and the polar bears. You also get a baby dragon who has various powers; I rely heavily on his tail whomping. It’s really well done; everything is easy to figure out even though there are a lot of options, such as many many creature types. But you get introduced to them slowly, and you have enough fights that you can experiment. There are some interesting strategic choices… e.g. you can go for a small number of really good creatures, or enormous stacks of cheap ones. You can explore as you like, but enemies are fairly carefully graded, so you end up slowly clearing one island of a time of mobs. It’s quite satisfying to see an island which was at first packed with armies marked “lethal” or “invincible” slowly get tamed. Anyway, I’ve put a lot of hours into it and I’m not even a third done. I’m not sure I’ll finish, but it is definitely a lot of entertainment for the dollar. I picked up Amy Chua’s World On Fire almost by accident. It’s amazing and really alarming. Her basic thesis is that the combination of market-dominant minorities and democracy is a powder keg. These are protoypically ethnic minorities that entirely dominate a nation’s economy. E.g. her own people, the Chinese of the Philippines, form 1% of the population but control 60% of the private economy, including its four airlines and most of its banks, hotels, shopping malls, and major corporations. Other examples include the Indians in East Africa, the whites in South Africa and Latin America, Eritreans in Ethiopia, Croatians in Serbia, the Tutsi in Rwanda, and the Lebanese and Ibo in West Africa. The problem is, economic liberalization– that is, the IMF’s favorite recipe of free markets, privatization, ease of access for foreign capital, and austerity programs for eveyone else– makes the economy grow, but if there’s a market-dominant minority the benefits flow almost entirely to them, leaving the majority living in slums with open sewers. Now throw in democracy, meaning universal elections. Our notion is that elections somehow prevent the excesses of dictatorship and war. But when there’s a market-dominant minority it’s highly resented, and demagogues will arise to target them. If they get power the likely result is either a backlash against the market (a wave of nationalization, looting, and/or genocide), or a backlash against democracy (the elite takes over, repressing the majority). Chua points out that Americans are exporting a fanciful version of our system which we never had to live under ourselves: laissez-faire capitalism without a social net or redistributive agencies, plus universal suffrage without strong court systems and protections for minorities. (Most Western countries never had a market-dominant minority, and also didn’t empower the masses till quite a bit had trickled down to them.) As in Iraq, we expect that these things will do magic, and never seem to learn what an explosive combination is produced by minority economic power plus majority political power. She also notes that the Asian Tigers were mostly exceptions to the pattern of market-dominant minorities: Japan, Korea, Singapore, Taiwan, and now China and to a large extent India. She talks about colonialism, which of course was an instance of her thesis: Europeans were a market-dominant minority worldwide. In some cases present-day dominant minorities were groups favored by the colonial powers in a divide-and-conquer strategy (e.g. the Kikuyu in Kenya)… effective at the time, a disaster in the long term. I’d even suggest that the cultural matrix of colonialism– the passivity encouraged in the masses– may be part of why we see this pattern in most of the world. It may be significant that those same Asian Tigers were either never colonized or colonized for only short periods. Chua examines a few edge cases, with a little less felicity. For instance, six out of the seven oligarchs who emerged in Yeltsin’s Russia are Jewish. This has certainly fueled a new buildup of anti-Semitism, but it certainly can’t be said that Jews dominate the economy, and (as she acknowledges) anti-Semitism has a long troubled history that doesn’t simply derive from market dominance. Sections on Arab resentment of Israel, and the world in general’s resentment of America, also feel like stretching the thesis. You can also have market-dominant minorities without democracy, and by her own account these can be explosive too. It’s true that an ethnic or racial minority can dominate for centuries, as in Latin America, and that a dictatorship can damp down ethnic tensions, as in Yugoslavia or Marcos’s Philippines. But a dictatorshp can also seize on ethnic resentment as a very effective prop to its own power– e.g. Idi Amin’s attacks on Indians in Uganda. And it’s kind of a devil’s bargain when a minority partners with a majority ruler, as the Chinese in the Philippines did with Marcos. This may only postpone the reckoning, and the dictator’s bite is likely to be enormous– e.g. the Marcoses demanded a free 25% stake in every corporation. The Russian oligarchs helped put Yelstin and then Putin in power, but Putin has moved against two of them and made it clear that no dissent is allowed. It’s not just democracy that’s made it harder to keep the lid on; global media shines a light on inequalities that used to be hidden, and globalization favors well-connected minorities– e.g. the Lebanese in West Africa and the Chinese in Southeast Asia can call on investment from back home. And of course modern insurgencies make it easier than ever for an aggrieved minority to take its revenge. First, of course, we should be aware of the problem and stop insisting on simultaneous laissez-faire capitalism plus universal elections. You can’t have both. She suggests mitigating both halves. More social net, more means to redistribute wealth to the majority, maybe a slower transition to democracy. (She notes that China hasn’t simply remained as a communist despotism; the old Maoists have been retired, local elections have been held, and the national congress is beginning to function as a place for real debate.) Dominant minorities could also make more of an effort towards helping the majority themselves; she notes with approval that one of the Russian tycoons, Roman Abramovich, has turned himself into a philanthropist, governing a remote Siberian province with largesse funded from his own coffers. It’s working so far; he’s very popular, unlike the other oligarchs. She also notes that where there’s less resentment of dominant minorities, it’s often because of some fairly drastic assimilation or affirmative action campaigns– e.g Thailand had some anti-Chinese measures in the last century, and Malaysia has done a lot to give Malays access to the professions and big business. Redistribution doesn’t have to be total to allay resentment. Chua carefully remains within a democratic capitalist worldview; she assumes that socialism doesn’t work. I think a more leftward stance would help here. She’s right that simple expropriation is usually catastrophic– e.g. Mugabe’s confiscation of white-owned farms, which hasn’t redistributed their huge import income to his landless followers, but simply destroyed it. But I think she assumes too readily that the IMF consensus actually produces prosperity, though badly distributed. Latin American and African economies, for instance, did significantly worse under neoliberalism. It’s also striking that the program preached to the Third World by the Very Serious Global People– free trade, no local control over currency, privatization, no tariffs, no unions, no regulation, austerity for the poor when the inevitable recession hits– is essentially their fantasy for the US and Europe as well. They rail against precisely those aspects of liberal capitalism that protect us from populist– or communist– resentment and revenge. Chua is pretty strong in her warnings, but I think she could be stronger: laissez-faire is a fantasy; you just can’t have your Randite utopia where the masses cheerfully accept their inequality forever. You can stay rich by adopting liberalism, or you can throw the dice and either maintain power by brute force or lose it to revolution. As Chua points out, the US economy as a whole has no market-dominant minority, but historically a part of it did: the white plantation owners of the South. And when they lost the Civil War they were terrified of democracy, which they assumed would turn into destructive vengeance by the black majority. They took the anti-democratic approach, and though this in turn was defeated, it’s affected our politics ever since. Fear of the poor, and the use of assumed cultural values to divide up the poor into clashing groups that can’t unite against the elite, are aspects of classic Southern politics that have been generalized nationally…. though they tend not to work so well in the blue states. Ironically, this is one of the reasons we’re exporting such a foolish combination to the rest of the world: our elites hate redistributive programs, but also have no experience of subjugation to market-dominant minorities. So they just have no idea of what’ll happen. Income inequality is one of the great unsolved problems of our time. Liberalism does work; the US’s decades of greatest prosperity were also the time when we had the most aggressive redistributive policies in place. But we haven’t figured out how to prevent the backlash from the elite. And new technologies plus non-sustainable energy are only going to exacerbate the problem in this century. Pundits are worrying about smaller government, and those with actual brains realize that any actual reduction means a smaller Defense Dept. Matt Yglesias asks what this might mean, and comes up with “gendarmes”… basically a national police force which can be used in “high-crime jurisdictions” as well as for occupations after an enemy was defeated. His commenters basically ream him a new one. 1) A national police force wouldn’t fly. 2) Different skill sets. 3) Posse comitatus. 4) That’s the National Guard, dummy. 5) Do you want COIN-trained military assigned to the drug war? All good points, but I think what Yglesias is really trying to say is twofold: first, the military is almost entirely oriented toward war; we’d be using our tax dollars a hell of a lot more efficiently if some large fraction of what we spend on it was useful domestically too. Second, we’re not really in a world where we’re about to refight WWII, so we need to radically rethink what kind of forces we need. It’s fair to say that we could use a “nation-building corps”. The example Yglesias gives is if North Korea is defeated; someone need to rush in from Day One and organize a state so it doesn’t fall into chaos or warlordism. But it’s also clear that this isn’t something resembling a national police force. A better sampling of Yglesias is here, where he points out the ending filibusters would be better not only now when Republicans are obstructing Democrats, but later when Democrats would be obstructing Republicans. Majority rule is a good thing, and filibusters in general have been retrogressive and more annoying than actually protective of anything. They didn’t prevent either the excesses of the Bush administration, or the substantial accomplishments of Obama. In case you’re turning here to see why the Language Construction Kit is not available this week— it’s because I’ve uploaded a corrected edition. It should be available again in about a week.